The Ladies for Liberty is a singing troupe dedicated to performing the Andrews Sisters style of music through their own rendition of vocals, costumes, hairstyles and the spirit of patriotism reminiscent of the 1940’s. 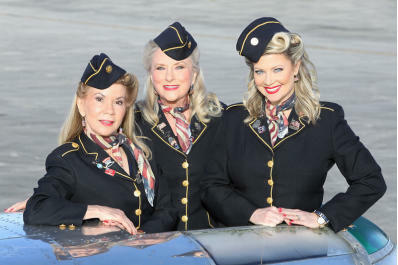 Let the Ladies take you back in time with songs like “Boogie Woogie Bugle Boy” and “Don’t Sit Under the Apple Tree”, all backed by a 7-piece Big Band, The Soldiers of Swing. Ticket price includes dinner, show, tax, & parking.